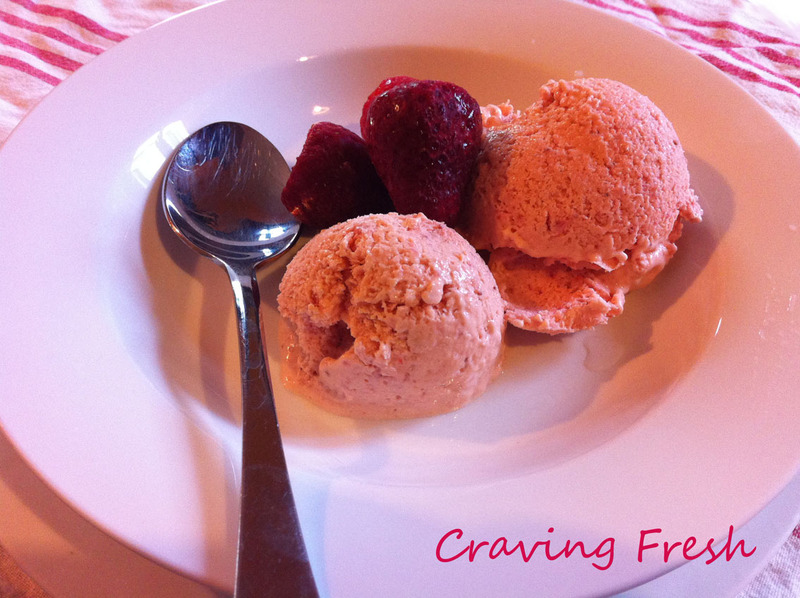 Here's a refreshing strawberry ice-cream recipe you can make at home, without an ice-cream maker. I'm sure it would work with an ice-cream maker too, I just don't have one so can't test that for you. I've been having fun playing around with different combinations of ingredients this past month, trying to come up with one the whole family enjoys. This recipe tastes great, but is a tiny bit icy. I think that's because I don't cook the strawberries first - preferring to leave them in their natural state so their enzymes stay active. If the icy factor really bothers you, try stewing the strawberries with the sugar and allowing them to cool before adding them to the food processor with the other ingredients. I've used raw egg yolks in this recipe, as we're now getting organic, free range eggs from the same farm I get my raw milk from. It's wonderful knowing we're eating all that yolky goodness in its natural state. Gelatin wasn't something I used to stock in my pantry, but now I always have it on hand because it is nutritious and a great base for so many natural dessert recipes. Think Pana Cotta, fruit pudding, this strawberry ice-cream recipe, real fruit jelly and more. I make this ice-cream using dextrose (AKA straight glucose or brewer's sugar) as the sweetener. Reading Sweet Poison taught me how harmful fructose can be in its naked form, so I've been trying to replace it with dextrose in home baking. All sucrose (AKA table sugar) is half dextrose and half fructose. Honey, maple syrup and unrefined sugars also contain fructose. 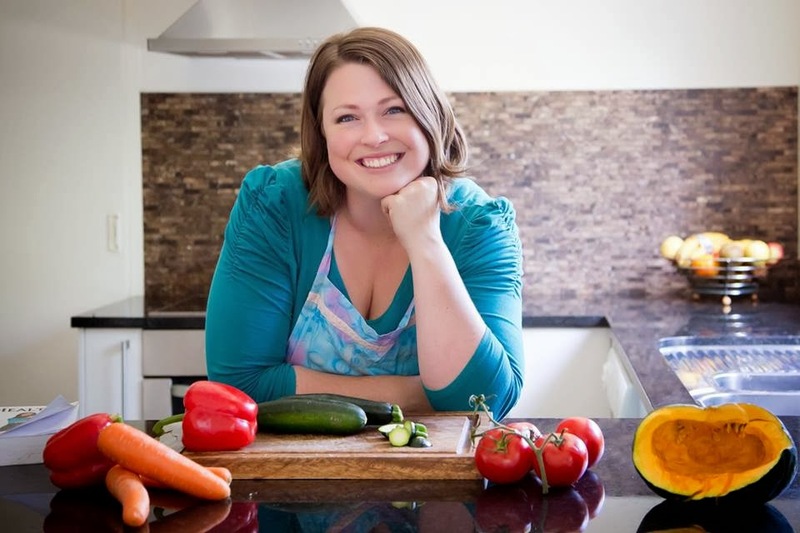 When you cut the fructose out of sugar, you lose half the sweetness, but you also eliminate all the downsides of eating sugar - addiction, blood sugar level swings, weight gain, myriads of possible diseases, etc. The real foodie in me is still in two minds about eating dextrose. It's not a whole food in its natural form, so it doesn't have all the other good things that come with unrefined sweeteners. However, I've got some serious weight to lose and want to work my way out of the sugar trap, so I'm giving dextrose a go. 1. Mix the gelatin and boiling water together in a bowl, stirring until the gelatin is dissolved. 3. Pour the gelatin mixture and dextrose/honey into the strawberry mixture and process again to combine. 4. Pour the whole mixture into a freezer-safe container and freeze until set. 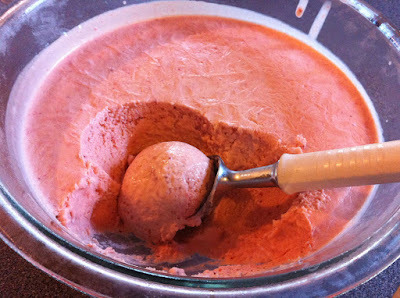 The gelatin should prevent the icecream from setting too hard, so you can scoop it out easily enough. Serve and enjoy. And enjoy. And enjoy! Lily eating homemade strawberry ice-cream in a cone. Looks very yummy. I wonder if mixing it again when partly set would get rid of the ice crystals in it. I am also wondering about using dextrose as it can become a source of msg. I have gelatin in a bigger bag. How many tsps would the 10 g be? I think it is 3 tsp. I just bought a bigger bag too, and I'm using 3 tsp.